View More In Soft-Sided Carriers. 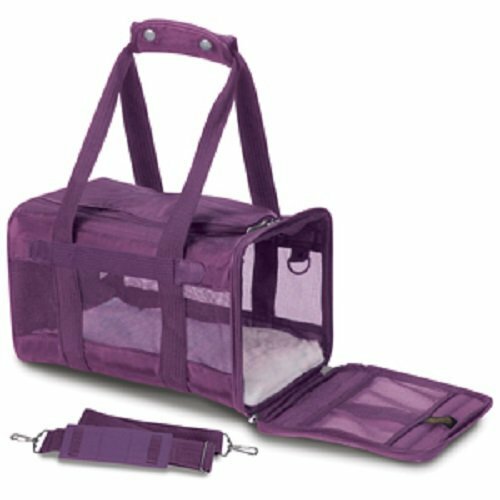 The Sherpa® Original Deluxe Carrier comes in multiple sizes and colors. Small is for pets up to 8 pounds and it measures 15 inches long, 10 inches high, and 8.5 inches wide. Medium is for pets up to 16 pounds and it measures 18 inches long, 11 inches high, and 10.5 inches wide. Large is for pets up to 22 pounds and it measures 19 inches long, 11.8 inches high, and 11.5 inches wide. Please note, only the Small and Medium Original Deluxe are part of Sherpa's Guaranteed On Board® program. The Large Original Deluxe is approved for use on most major domestic airlines (check with your airline before flying). If you have any questions about this product by Sherpa, contact us by completing and submitting the form below. If you are looking for a specif part number, please include it with your message.